Duly not infested by insects, Macy decides to embrace what she wants rather than focusing on whether people want her (which is an excellent line, especially looking at her issues over who is seen as appealing and racial prejudices) and decides she wants Galvin! Who is a bit down and depressed because Summer broke up with him and now his funding’s being cut (but I definitely appreciate that even while sympathetic with him, Macy is totally not accepting him speaking to her disrespectfully). So she’s asking him to be back on a again which he agrees to and, wow, Summer’s shadow is still on his door! He hasn’t changed the sheets yet, Macy! He’s in for this - but then he gets hit by a car. Oops. Listen to the magical protective symbols! So now to the real plot - Mel. Mel opens with some frustration that Charity disapproves of her using magic to help mortal problems - they fight demons, they don’t solve perfectly human crime. And I think I’m meant to disagree with this but… Charity’s not wrong? There are demons out there, apparently doing terrible things and they can (bug squishing aside) only be stopped by magic. It makes sense to prioritise here and let mundanes handle what they can so you can focus on what they can’t. And, anyway, given Mel’s interests, passions and causes I would have thought she’d be duly wary of magical, unregulated vigilantes solving crime according to their own unchecked, unbalanced ideals guided mainly by their super powers that put them at an extreme advantage over their opponents: especially since criminality itself comes with a lot of shades of grey, addiction and socio-economic drivers that “freezing time and kicking arse” would not address. Mel should think about things like this. Mel should know better than to see human crime as something as simple as “catch the bad guys”. If you’re going to create a character who is all about social justice then MAKE HER ABOUT SOCIAL JUSTICE and this means far more than chanting buzz words - it means recognising systemic problems that disproportionately affect minorities. So Mel is upset and this is when the lightning woman finds her. She is Jada, half witch, half whitelighter and she works for the Sarcana. Or the Sisters of Arcana. 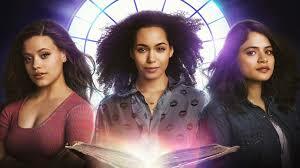 While Charity and Harry say the Sisters of Arcana are terrorists who, at best, use their magic carelessly and recklessly and, at worst, use magic without caring who they hurt. They’re also responsible for Harry’s lost charge and Charity’s little sister Fiona dying. I think it’s going to turn out the elders are evil or at least misguided and the Sarcana are good. But I also think I’ll be frustrated because it will lack any kind of nuance or depth and a general amount of cheering of unregulated vigilantism, lack of oversight and a general assumption that “the protagonist is always good and right” which is always cringe worthy. Mel does agree to go undercover for Charity… which is going to end with her changing sides. Except she’s knocked out by one of them - because she nearly saw Fiona. Who is apparently alive.